Bill Ward played heavy. That much I think we can all agree on. 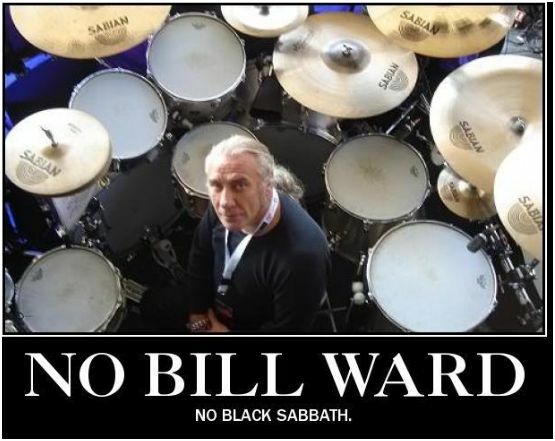 But Ward, like all the architects of heavy metal drumming (Bonham, Paice, Baker, Appice, et al.) grew up hearing and emulating big band and dance band drummers (Gene Krupa, Buddy Rich, Butch Miles, Jo Jones etc. ), as well as rock and R&B drummers from the era when drummers tended to play swing patterns on hi-hat and ride rather than straight eights. It should hardly need saying that while there are a lot of qualities that are universal in playing the drums (any instrument, for that matter), the emphasis in heavy rock and metal on power and aggression is not present in dance-band styles. But Ward and Bonham and co. were still products of their era, and they retained a swinginess that their later followers have mostly lost. On A National Acrobat from Sabbath’s fifth album Sabbath Bloody Sabbath Ward responds to the inherent groove of Tony Iommi’s riff with one of the must supple performances in all of heavy rock, with snatched 4-stroke rolls (in 16th notes) and 8th-note triplets fills at the end of the vocal phrases. He sticks to this formula for all of the first section, but it never gets boring; it’s too well played and the groove is addictive. It just carries you with it. The same feel is maintained through the next section (starting about 2.15 when Ozzy sings ‘You gotta believe me’), but with variations now. Ward displaces the first backbeat in each bar to the ‘and’ (one-and-two-AND-three-and-FOUR-and). It’s a well-timed switch, just changing one little element to keep listeners hooked. There’s one more verse after Iommi’s solo then the basic groove changes significantly at about 4.50 to a prototype of the ‘galloping’ Iron Maiden rhythm. It’s loose compared to how Maiden or later thrash bands would have played it, but it sounds cool: Sabbath were never about how tight the band played. They were about the feeling between Iommi (far more than Jimmy Page, the inventor of heavy metal guitar) and the rhythm section of Bill Ward and Geezer Butler, schooled in jazz, swing and R&B but still the definition of what ‘heavy’ is in rock music. This entry was posted in Music and tagged A National Acrobat, Bill Ward, Black Sabbath, Butch Miles, Carmen Appice, drummers, drumming, Drums, Geezer Butler, Gene Krupa, heavy metal, heavy rock, Ian Paice, Jimmy Page, Jo Jones, John Bonham, National Acrobat, Ozzy Osbourne, Sabbath Bloody Sabbath, Tony Iommi on November 10, 2013 by rossjpalmer.